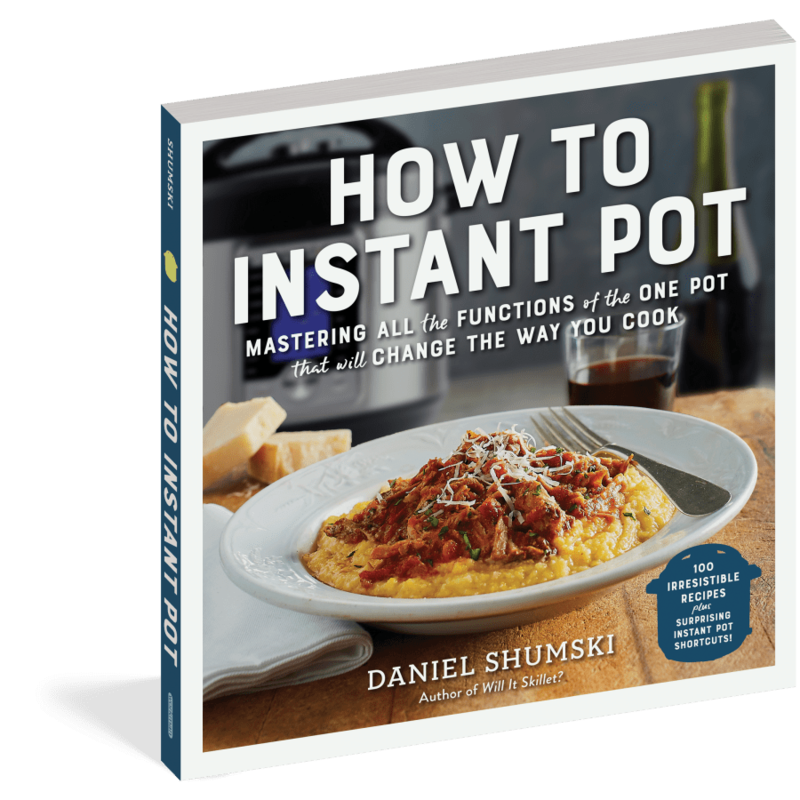 I’m excited to introduce you to my favorite way to cook dinner, and my new go-to cookbook, How To Instant Pot by Daniel Shumski. Workman sent me a copy to check out, and is partnering with me for a giveaway! Amazon affiliate links are used within this post. I just got back from a family cruise this past week, and while I was enjoying all the food I could eat, prepared by someone else (I mean, is there anything better in life??) I had multiple conversations with my aunt about my love for my Instant Pot. I was a fast convert about a year and a half ago, when I got my Instant Pot pressure cooker, and I have convinced many friends and family members to get their own (I’m serious. If you don’t have one already, you should get one for yourself for Christmas). The problem I’ve found with these new Instant Pot owners is that they have no idea how to use it or what to make in it. The documentation that comes with the appliance is sorely lacking in helpful information, and if you don’t have a next door neighbor to walk you through the functions and all of the buttons, well, it could be easy to get lost or overwhelmed. 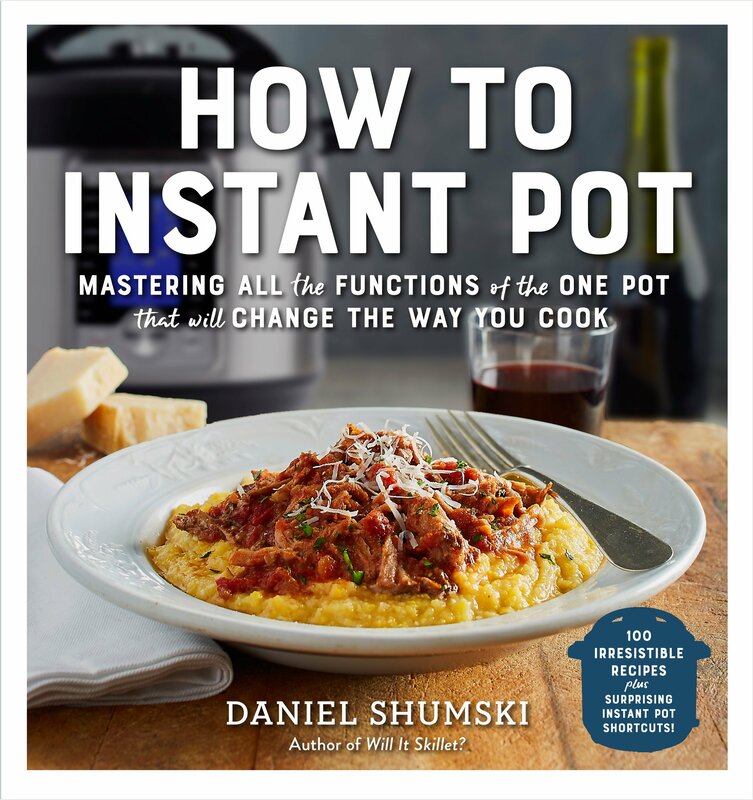 I am so excited about my new cookbook – How to Instant Pot by Daniel Shumski!! Not only is it full of delicious recipes with beautiful photos, but it answers ALL of your Instant Pot questions. Chapter 1 is full of helpful hints, tricks, and how-tos, written in easy-to-understand terms. And then each recipe spells out exactly what buttons you push and when, taking the guess work out of cooking with the Instant Pot. 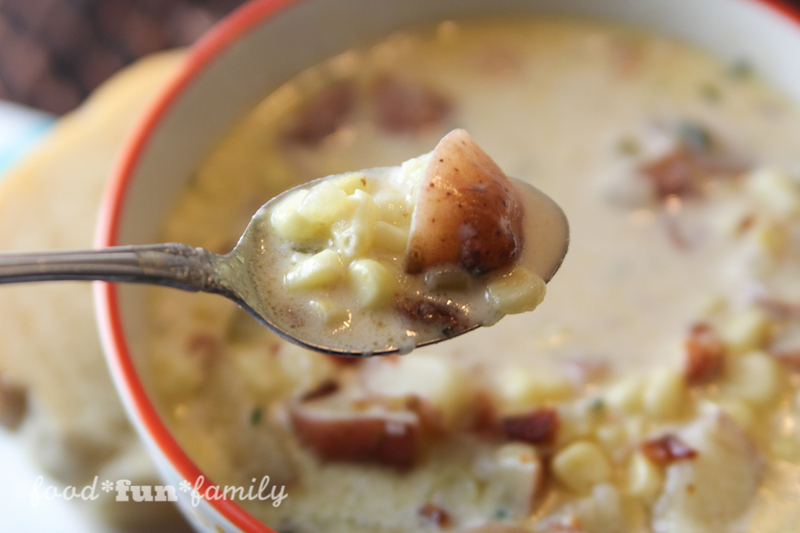 I was drawn to this recipe for Bacon, Corn, and Potato Chowder (I mean, doesn’t it look delicious?? ), so I whipped it up for dinner the other night. It did not disappoint! The whole family loved it! Recipe excerpted with permission from How to Instant Pot by Daniel Shumski (Workman Publishing). Copyright © 2017. Photographs by Ken Carlson. Line the bottom of the inner pot with the bacon. Press Saute and use the Saute or Adjust button to select the middle temperature ("Normal"). Cook with the lid off and use a silicone spatula or wooden spoon to move the bacon around occassionally so that it cooks evenly. Cook until the bacon is crisp, about 6 minutes. Remove the bacon, leaving behind the fat. Allow the bacon to drain on a paper towel-lined plate until step 7. With the Saute function and middle temperature ("Normal") still selected, add the onion and celery to the bacon fat. Cook with the lid off, stirring occasionally, until the onion and celery soften, about 5 minutes. Add the potatoes and bay leaves. Wait a moment and then pour in the broth. (Adding the potatoes first lets the temperature in the inner pot cool down a bit so that steam doesn't woosh up when the broth is added). Close and lock the lid. Set the valve to Sealing. Press Cancel, then press Manual or Pressure Cook and use the Pressure or Pressure Level button to select High Pressure. Use the - or + button to set the time to 1 minute. When the cooking cycle ends, carefully use a wooden spoon to release the pressure by turning the pressure-release valve to Venting. (The pressure is released when the small metal float valve next to the pressure-release valve sinks back into the lid and the lid is no longer locked). Remove the liid. Discard the bay leaves. Add the corn, thyme, salt, pepper, milk, and hot sauce. Press Cancel, then press Saute and use the Saute or Adjust button to select the lowest temperature ("Less"). Cook with the lid off, stirring occasionally, until the chowder is hot, about 5 minutes. Chop the bacon. Add half of the bacon to the chowder and stir to distribute it; reserve the rest to use as a garnish. Serve the chowder hot, garnished with the reserved bacon. Note: Bacon, Corn, and Potato Chowder will keep, in an airtight container in the refrigerator, for up to 3 days. To reheat, place the chowder in a pot and warm on the stovetop over medium heat, stirring occasionally, for about 5 minutes. I loved adding some Ritz crackers, crushed, to my chowder. I highly recommend it! Master the revolutionary appliance that’s changing the way we cook! The only Instant Pot cookbook that is organized by function, How to Instant Pot is both a guide to understanding the Instant Pot basics and a foodie’s creative collection of over 100 recipes specially crafted to take advantage of the Instant Pot’s many virtues, from cooking perfect risotto in six minutes, no stirring required, to five kinds of yogurt, to creating one-hour killer chili and soups from scratch, using dried beans. 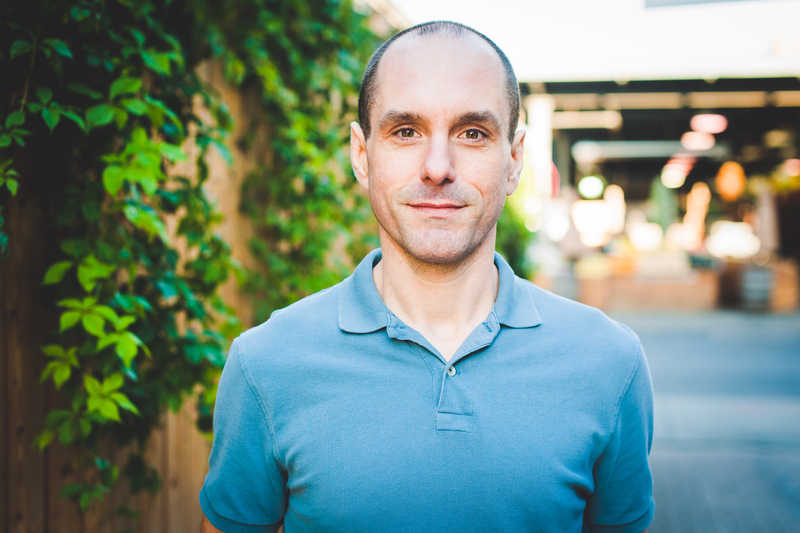 Daniel Shumski is a writer and editor who has hunted ramen in Tokyo for the Washington Post and tracked down ice cream in Buenos Aires for the Los Angeles Times. Between stints at the Chicago Sun-Times and the Chicago Tribune, he worked for a Midwestern heirloom apple orchard. His bestselling first book, Will It Waffle? : 53 Irresistible and Unexpected Recipes to Make in a Waffle Iron, won praise from the New York Times, People magazine, and Food52. He lives in Montreal. Prizing and samples provided by Workman Publishing. This giveaway will end on 12/21 at 11:59pm ET, after which a winner will be chosen at random and notified via email. Good luck! © 2017 – 2018, Food Fun Family. All rights reserved. 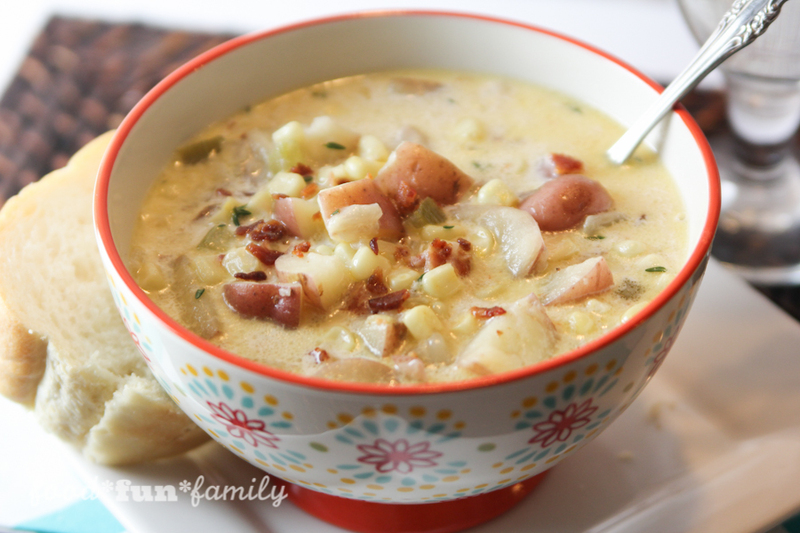 Just tried out my insta pot for the first time with your potato,bacon,corn chowder recipe! It is wonderful! What would you recommend to make it of a little thicker consistency ? There are lots of things you can do to thicken a soup. The easiest for me is to make a roux by mixing equal parts corn starch and cold water or broth (you just need a little…start with a tablespoon or two). Mix them thoroughly and then add them to the hot soup. As you heat & stir the soup, the soup will thicken. Adding some instant mashed potato flakes works quite nicely for thickening. Just don’t get too many! 1/4 WHAT of hot sauce? Tsp? TBSP? It’s 1/4 teaspoon. My recipe plugin randomly deletes measurements sometimes. It’s the strangest thing! Updated now! Hmm. That’s odd! I’ve never had my meat burn on the bottom. But I do have a rack (it came with my IP) – I use it for things that I don’t want to be sitting in the juices as much. Sorry. I just saw your question. Step 4 says to set the timer for 1 minute. Did you figure that out? After the cook time is done, the Instant Pot will beep. The instructions from the cookbook are more detailed than any other IP recipe I’ve used. It worked for me when I followed each step to the mark. Your chowder recipe sounds fabulous! Pinned it. Thanks for sharing with us at Merry Monday. Hope to see you next week. Happy New Year. I hope to get an Instant Pot for Christmas and I want to first try a chili! This pot of soup looks amazing. I am also loving my Instant Pot and find that the lack of directions are definitely a problem. I took Erin Chase’s Instant Pot course and learned a lot when I first started using my Instant Pot. Thanks for sharing the recipe. I can’t wait to try it! Looks delicious! I can’t wait to give it a try. I love to make chicken in my Instant Pot! I make four different kinds and freeze it! I recently made potato soup in my instant pot- so yummy! 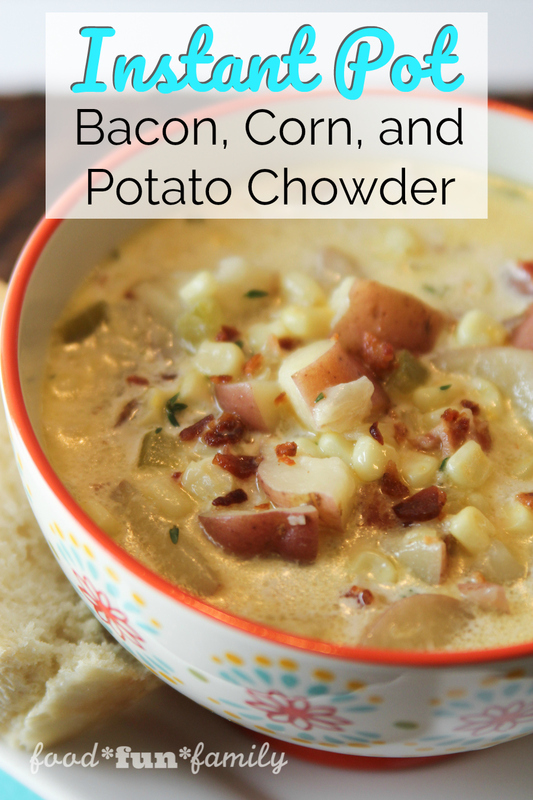 I don’t own an InstaPot but would love to and I would make this recipe Bacon Corn and Potato Chowder first as it looks absolutely delish! 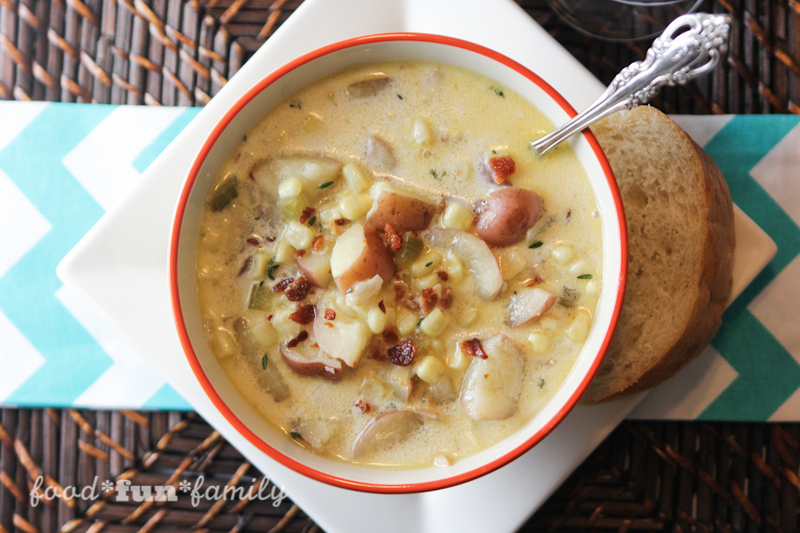 I don’t have an Instant Pot yet, but that chowder looks yummy for these cold winter days! Commented on Five Reasons to See Disney*Pixar’s Coco In Theaters. I’d love to make soups.